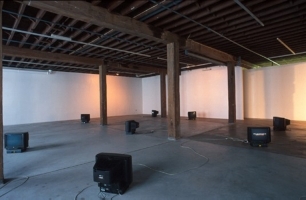 at Artspace, Sydney, April 1997. Catalogue essay by Jacqueline Millner. The room is punctuated sharply by nine televisions, scattered in a loose grid on the floor, facing away from each other at oblique angles. Filtered sunlight drifts in from the window, the soothing sound of running water is barely discernible. Already, the distinction from the usual mode of experiencing the televisual is unmistakable. No cacophony, no mad montage of images, just calm austerity. The sets appear to be entirely mute, before a text ripples to the surface of a single screen for a few seconds. The letters swim in striations of subtle colour to denote an intriguing observation, a fragment teasing you to discover its secret. We wait for the next clue, but the screen quickly goes blank again. So we search for another fragment amongst the other screens, realising that because most of the sets are turned away from our gaze, we are compelled to approach each separately. And as we do so, another elusive fragment appears on a distant screen, illegible from this vantage point. We move to catch it, but it sinks back into the screen. Frustrated, we again try to physically gather these disparate wisps of text. We pick up our pace, traversing the room at speed, rushing from one screen to another, layering the fragments in our memory to try to force them to yield some coherence. And then another distinction from our conventional relationship to the television hits us. We are not lounging immobile in the cathode ray glow, but exerting ourselves in an attempt to conjure meaning. These televisions have got us working. Chris Fortescue has constructed a witty maze for musing on the way we consume information in a mass media age. Experimenting with different modes of ingesting text, he has brought the literary and the televisual – that archetype of junk-culture – into collision. This is not cut-up; there is still some faint narrative resonance, although so faint as to almost infuriate. By contrast, television’s boundless offerings create the semblance of infinite knowledge, promising omniscience, if only we surrender ourselves. Television unloads endless streams of programming in a pretence of unmediated immediacy. It convinces many of us that tuning in connects us in a most profound way to the world stage, to each other, but turning off risks the trauma of the loss of this community- I can’t close my eyes…this is all I have.. And yet in this rite of media ‘participation’, we are largely passive recipients; it is the television which holds us in its thrall, controls our movements, even, pins us to the spot. In Fortescue’s maze, however, our dream of perfect knowledge is forever frustrated. We play sleuth, but the fragments remain fragments, intriguing enough to suggest a fractured narrative, but never sufficient to solve the puzzle. This work hints at the elusive, incomplete nature of knowing, but plays with the contradiction that the certainty of this does not staunch our desire for perfect knowledge – for at least the semblance of wholeness, the sort of wholeness we can pretend to in the solipsistic cycle of information media. TV would have us believe that it withholds nothing from us, that it is all-giving, all-encompassing. These textual fragments which elude but fascinate us are taken from a body of Fortescue’s fictional writings. They read almost like diary extracts, personal recollections of a simple, solitary existence. They are marked by a sensitivity to the little things, the overlooked, betray a delight in the minute idiosyncrasies of routine. (They may or may not be autobiographical, although the title does suggest a measure of personal revelation, with the attendant risk of stasis or ossification). The narrative voice appears to take pleasure in austerity and sparseness, comfort in domesticity and the familiarity of things. The snatches of text are moreover suffused in sensory perceptions: the sound of the rain, the smell of a match, the whistling of the kettle or bubbling of the pot on the stove. Tea, rain, seashore: water, fluidity, are ever present here, reinforced by a subtle soundtrack of drips and currents. The language is plain, devoid of artifice, spare, the tenor one of self-absorption, of nostalgia evoked by meditating on memory-laden objects: a letter, a pebble, a chopping knife. While the elements and word-images remain suspended and isolated, the longer we spend with the piece, the more intense is the sensation that this intersection of banal details may evolve into some suspenseful scenario. It is as if these fragments are goading us to narrative, but holding out on us at the same time. The contrast between the pared-back simplicity of the writing and the excess of televisual media is jolting. Moreover, the textual emphasis on sensual experience – textures, sounds, smells – serves to foreground the exclusively visual mode of TV-watching. And yet, these quiet, sensual pleasures are nonetheless communicated to us via the small screen. Fortescue appears to be concerned both with how the reading of his writings in this manner might skew their meaning, and how the experience of watching television might be interrogated by using the box as a kind of interactive book. Indeed, the nature of interaction with information itself is at issue here: how does our mind/body take up information? How is this changed by physical interaction? How do text or moving images produce coherent meanings, and how does the medium change the message? Fortescue’s installation demands that we spend time with it; a cursory walk around these black boxes will yield little. It is by spending time, quiet, meditative time, and active physical time, that the complexity of the work begins to emerge. And it is an awareness of this time, inherent in our manner of taking the work in, that brings to our attention the meaning of this work, in all its humour, sensitivity and poetry.